1. When did you make you first board? What was it? How was the experience of making and riding this board? In 1972, I stripped down an old plank and put in a line of through-board holes to see if air would be sucked under the board. 2. What was your involvement in the surfing industry? When did you start and whom did you work for? Any major influences? I started working for Midget Farrelly in 1977, blowing blanks, cutting and glueing in stringers. I wrote to Geoff McCoy saying I’d do anything for a shaping apprenticeship but I still haven’t heard back. 3. What jobs did you do and when did you leave the industry? After Farrelly’s, I figured I could do all the work myself so I started making my own boards and doing part time repairs and some restorations. But I always bought fins rather than make them. I still do repairs and make my own boards today. 4. When did you first hear about or see paipo boards? About mid-70s, I saw a few in Hawaii but when Morey brought out his Boogie boards I just thought it was a plasticised paipo. 5. What got you started riding and making them? When was this? 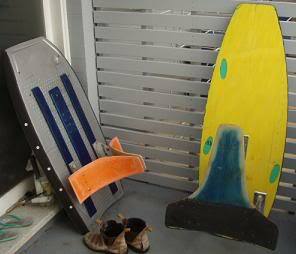 Growing up everyone I knew rode anything we could find, snapped boards were a treasure to hoard but flat wooden belly boards with a bit of nose lift were common at Bondi as well as inflatable mats so I surely rode a paipo before I knew what it was. Every board we had we always reworked it as it disintegrated in the surf - so I didn’t make a whole paipo until the 1980's. Since then I’ve maybe made 50 or 60 from flat ply ones to 3 inch thick carbon fiber and epoxy composite rockets. 6. What interested you about paipo boards? Paipos are wonderful because you can dream up a shape, cut it out and be in the surf testing it 15 minutes later. They are as fast as anything else in the water and you’re not limited from adding to the design. I like the ability to add something and change it over and over again. They’re a great test board to figure out things like how fin placement affects performance. 7. You once wrote, “I reckon most of the surfboard theory is relevant to paipos, but I’m not sure how much.” Care to elaborate on this? How a surfcraft performs is based on the board, the wave and the rider and because of the prone riding position paipos work on a slightly different set of forces to other craft. Rocker is less important than on a surfboard because a paipo can be shaped to flex under pressure so I believe a flat paipo that flexes through turns is the perfect design. And yet surfboard shapers agonise over replicating rocker curve on every board, so its "horses for courses" with designing different types of boards. Fins and paipo... D fins or raked fins? All fins are good on a paipo but every control surface is also a drag surface so there is a limit to what works without being a liability. I’ve tried a heap of different fins but I like smaller, thin aluminium twin fins for most waves. But I think there’s a lot more to be discovered with tunnel fins. Squared noses? Square noses are better, better planing area up front and less dangerous. The relationship between rocker and plane shape? Rocker sets the speed and plane shape controls the turning, but all parts work together anyway. At the moment for paipos I’m staying with nose lift of 4cm over the first 20cm and then flat through to the tail. I don’t change the rocker but I change the plane shape and rails for different turning and hold effects. Function and location of the wide point? A board turns around its widepoint in a turn so it acts a bit like a fin and a thinner rail gives greater hold. The crucial measurement is the distance from the tail to the widepoint. Wide versus narrow tails? I’ve made boards with 12 inch tails but they are too thin unless you’re on a big wave so for most waves a wider tail gives the greatest lift. The tail is the only part of the board that stays in the water so it makes sense that its the widest part of a board but it does make the board turn from the tail. 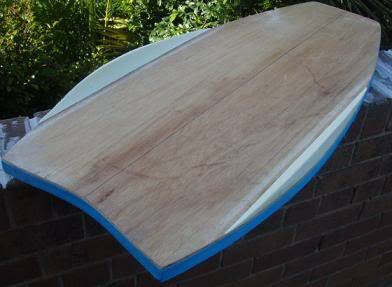 Most of my boards are 16-20 inch wide at the tail. Bottom shape? Flat or concave? The shape of the bottom/hull reflects the energy of the rising water and a flat bottom does that more efficiently and predictably than other shapes. So it’s the best overall but channels and concaves provide extra control so on the right wave they’re great. Some bodyboards have short subtle grooves and the like and the claims are that they are real performers but they aren’t, it’s like putting a 1/8 inch fin on and saying its brilliant. Performance requires effective design it doesn’t happen with timid shaping. 9. 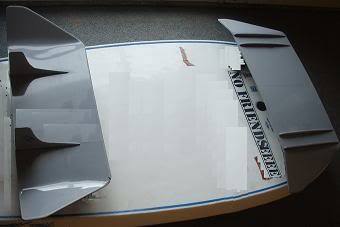 You once wrote in an e-mail, “The rising tide of unloved prototypes is getting higher and higher under the house.” I’ve read about the flipper, the cat board, the unifoil, hydroplanes and tunnel fins. Where do you get your ideas from? Sometimes I steal an idea and try to improve it, sometimes an idea comes from another industry and some just float in on the ether. Some people can’t conjure up new ideas, but I’m plagued by too many. 10. Do you follow an idea through to its end conclusion or is the process of experimentation more random? Some ideas are just a flight of fancy and they don’t have a clear path to follow to refine but most of my ideas end up with a few dozen versions, some are instantly hidden because they didn’t work in the surf but there are fewer of those now. If I can’t work out where to improve a design I stash it under the house so I can come back to it later. 11. What is the purpose of your experimentation? I don’t have purpose for experimenting, it’s just something I do and I can’t not do. It'd be nice to create some immortal design that improves surfcraft but shaping is always fun so the creation itself is motivation and reward enough. 12. What types of waves do you build boards for? 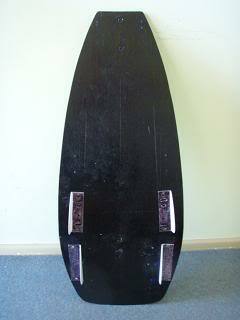 Are your boards primarily built to turn or for speed? Any memorable waves/surfs stand out? Average waves. Perfect waves are rare and fickle and all waves start as a bump and end in foam so a good board should always be able to perform across a wide range of conditions otherwise the board is disappointing. Unless you’re riding Pipe and only Pipe then a board with a universal design will give the greatest fun. Speed isn’t hard to harness with a flat rocker and a board can still turn really well because of the shortness of paipos and use of the widepoint. I have a few boards with 6 channels for straight line closeouts but most boards hit a similar top speed. Some of my best surfs have beenat reef breaks so I tend to avoid the beachbreaks. 13. Do you see any other paipos around where you surf? 14. You are currently working on a new board. How are things progressing? What are the design features and construction of these boards? What sort of feedback have you had so far? The boards are going slowly, I’m trying to ensure that they are the built perfectly and detail takes time. I exasperate the guys at the factory and myself but if you’re putting your name on something, it better be good. 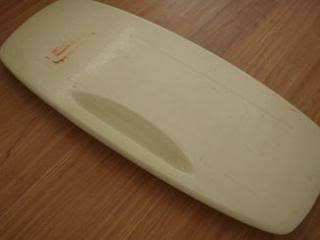 The boards can be seen at http://surffoils.blogspot.com but the basics are an EPS core with an ABS plastic shell, its light, it flexes and its bulletproof. Some of the feedback is predictably shy because its something different but I believe that people who are interested in shaping, paipos, bodyboards, alternate prone craft, mature riders and collectors will want to get their hands on one because it’s something different and unique. I also have 2 other designs in the wings that I hope to make with the same construction technique. One’s a Tube Hunter with either 4 or 6 channels and there’s a board with an ABS hull and a soft foam deck skin so its a true alternate to a standard bodyboard. All in good time. EVA topped, ply paipo with parallel rail fins. EVA/ply/polycarbonate paipo with Aluminium fins. test the effect of surface area reduction. Aluminium fins. SURFFOILS 2010.wmv (January 01, 2010). Visit Brett's website at http://surffoils.blogspot.com. Feel free to send me suggestions, comments and additional information to: The Paipo Interviews.